Paul, an old friend of the site recently contacted me after several years. A simple Hello inquiring about the LED DRLs I sell on this site. He said he had been working hard on his TT and that the only mod left on it was the DRLs. It got me started… “What did you do to your TT? any pics?”. I applause Paul’s courage as this project did require a lot of time and, well dollars. But the mods Paul did on his TT does not stop at the body kit, all the obvious has been looked after, such as suspension, engine, interior and sound system. His TT is a bit like a DTM revisited for street + killer audio. Here are the pics Paul sent me. His TT is now baptized TT AUTHORITY. Now, having seen many heavily modified TTs in the past months did 2 things to me. At the beginning, I wanted to join the group and go for a body kit myself. Since I have to get my TT painted in the next few months, I thought I’d have it customized at the same time. My ideal goal would be to create what would have been a TTRS of first generation. A TTR or TTRS – 8N. Wouldn’t it be wonderfull? There were RS4s, why not TTRs with a wide body and V6Turbo? But, yes there’s a but, after seing all these modified TTs I started to think… Since I whish to keep my TT for many years to come, it has to still look nice in say 5 years or more. Heavy mods do not stand against time attack. After a few months/years, heavily modified cars start to look like old broads with a face lift. See what I mean? I guess that my fellow purist friends in UK finally made it to my mind. I am starting to think that the best looking TTs are slighly customized (read DRLs, engine, suspension, etc) but really OEM looking. The TT desing is already close to perfection (that is for MK1 enthousiasts like I am!) so why go through so much mods to change its look? Yeah, I’m getting there. I see the value in keeping the TT close to its original design while still making slight modifications. -> Thoughts? I’d like to read them. Post below. 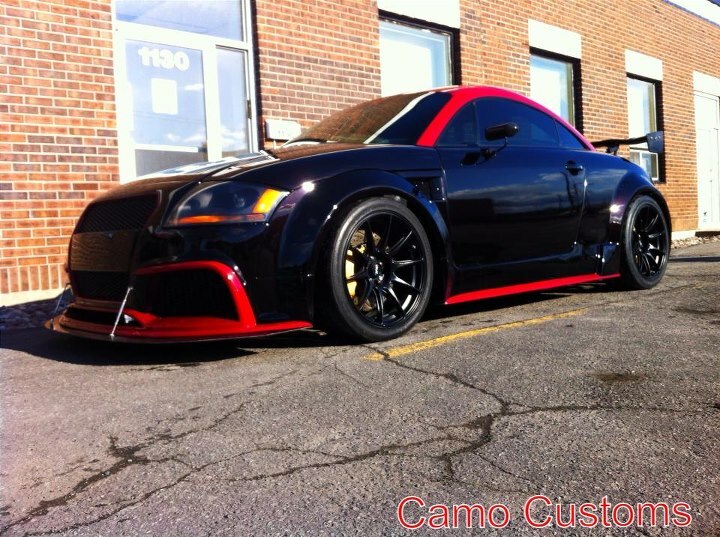 This entry was posted in Audi TT MK1, Community and tagged Regula Tuning, wide body. Bookmark the permalink. Where can you get a spoiler like Paul has on his TT? I will ask Paul to reply! The wing is from APR USA 3 position adjustable , the brackets is custom made aluminium .